I adore avocados and eat them every week. It’s not uncommon for me to go through 3-5 avocados in a week. I put them on eggs, salads, make gluten-free brownies, top enchiladas, make guacamole with them…the list goes on and on. There are so many recipes that utilize this awesome fruit. Give it a go…you won’t be disappointed. Each day this week, I’ll list 2 different health benefits of avocados AND, post a video, showcasing a different way to use this amazing plant. After dinner last night, we decided to head over to our favorite frozen yogurt (froyo) shoppe. It’s not a treat we have often, but it’s nice to indulge here and there. As it had been some time since I personally have gone for froyo, I was pleasantly surprised to see boba among the topping choices. The shoppe also has started carrying boba drinks. Thai iced tea and boba drinks are among my favorite drinks and it’s truly a simple pleasure. I was elated to see the boba as a yogurt topping! I went completely overboard with the toppings and completely cheated on my gluten-free diet, but I was in pure bliss, even if was only for a few moments. It’s funny how I now find pleasure and joy in the simplest of things. I admit, I’m a pseudo-boba addict, and it’s something I am completely ok with. If you have yet to experience boba for yourself, I highly recommend doing so as soon as you can. I was excited to post this coleslaw that I made last night. It’s the second time making it since originally find it in a friend’s Facebook post. I thought I had taken pictures of my prep work, but apparently I hadn’t. Then I only took one picture of the final product and managed to delete it upon reviewing pictures. UGH! How am I supposed to blog about it without sharing pictures? UPDATE: I uploaded the pic to WP before my deleting spree took effect. Never fear…Google to the rescue! I actually tracked down the exact recipe from another food blog! The recipe is really simple. I like that it only has a few ingredients and one of them isn’t mayonnaise. I have never liked the creamy oil and egg concoction. I’d go without eating than eat a sandwich with mayo slathered all over it. Not to mention, mayo-free means less calories. No longer need to worry about spoilage for a summer picnic. I know for some people it won’t be the same. As I never jumped on the mayo bandwagon, I wasn’t missing anything and I am more willing to try dishes such as this. Using fresh ingredients also means I can guarantee it’s gluten-free, which is a requirement for my diet. Another reason I like this recipe is the use of fresh lemon juice, instead of vinegar. Don’t get me wrong, I love vinegars; have 6 variations in my pantry. I like the “pop” of flavor from the lemon and its zest. This recipe also uses honey instead of sugar. I have significantly cut refined sugar from my diet; including my coffee! I’ve noticed how sluggish I used to be once my sugar-high crashed like the waves against a shoreline in a Category-5 hurricane. It’s nice to be free of those highs and lows. I’ve listed in the ingredients and recipe below, but please visit the website to see the amazing pictures of this simple, yet tasty, coleslaw. Remove any tough outer leaves from the cabbage. Trim the core and any tough stems from the cabbage and thinly slice. Add to a bowl with the shredded carrot, lemon zest, lemon juice, olive oil, honey, salt and black pepper. Toss to combine. Serve this right away for more of a salad, or store it in the fridge overnight for a slaw that’s more pickled. I never experienced Thai food until after arriving in California. Where I live, we have a very diverse cultural influence. There’s good and bad to that aspect, however, where food is concerned, it doesn’t get much better. The very first time I had ever had Thai food, I had just finished a catering gig in San Francisco. 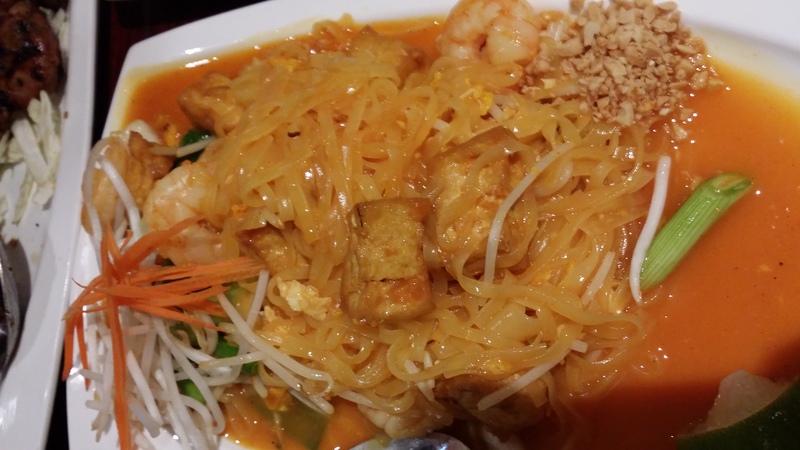 Some of my coworkers dragged me along, knowing I was still new to the area, for Thai food. I had no idea what to expect. We ended up in the Castro district of San Francisco. The Thai restaurant was on the second level of what looked like a house. I’ll never forget the entrance. Me being the somewhat naive country girl, did a slight double take at the bar immediately bordering the restaurant: Daddy’s Bar. Conjur up whatever images you like, but I knew then why the Castro had its notoriety. The restaurant’s decor, made me feel like I had stepped into another time. I was immediately drawn in. Where my hesitations previously had been, now had been replaced with a sense of adventure in trying something new. I only remember eating pad thai and a curry potato dish. That began my love of Thai food. Since then, I have eaten at various Thai restaurants around the Bay Area. My favorite spot is about 10 minutes from my home. The dish I fell in love with all those years ago is called Pad Thai. I think every culture has their standard noodle dish, and this, in my opinion is the one for Thai. It’s made using a long, flat rice noodle. I have no idea what truly goes into the sauce. I suppose I could look it up, but as it’s made differently depending on who’s recipe you used, I’m content in just eating it at the restaurant. The sauce is a sweet and tangy with a reddish color. Depending who makes it, the sauce can go from orange to red. Some of the other ingredients are fried tofu,scrambled egg, alpha sprouts, peanuts, sliver of carrots, green onions and a lime wedge. There is the option of adding meat. I typically order it with shrimp, although for the years I spent as a vegetarian, I had it without meat. Another favorite of mine is the fresh shrimp rolls. My daughter doesn’t like this one because of the rice paper it’s wrapped in. I admit, it can take a bit of getting used to and they are not good the next day because of the rice paper. However, these wonderful rolls, cut in half make 6 tantalizing bites for your mouth to experience. The roll’s filling consist of shrimp (or you can omit) and fresh vegetables. I’m not 100% sure which vegetables are in it, because it’s hard to identify all rolled up. It doesn’t really matter to me as I like vegetarian options. Part of me will always enjoy my time as a vegetarian (even if some seafood is sprinkled in). 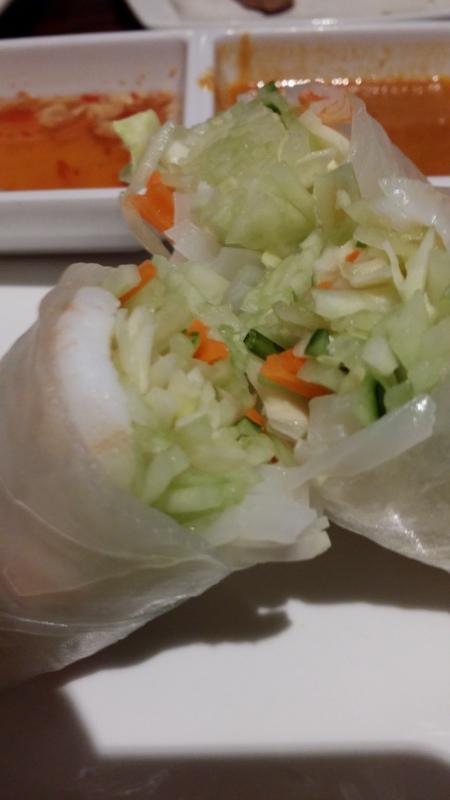 The rolls are served with either a sweet and sour sauce (thin sauce with a bit of kick to it – not like Chinese sweet and sour sauce) or a spicy peanut sauce. I prefer the peanut sauce. I never have to worry about my sinuses after eating that. Woo! A couple other dishes that I don’t get to eat as often as I’d like, as I share my order with my daughter, is something called yellow curry. I was a bit hesitant to try this dish, all those years ago in San Francisco. The word curry brought images of burning tongues and sweating foreheads to mind. As I was reassured, it was a mild curry, I was delighted with the flavor of this dish. I’ve ordered it on and off through the years. It’s made with coconut milk, potatoes and onions and of course, yellow curry. It’s not a pretty dish, but it is really good. Coconut milk; another new thing for me. I had never consumed food made with coconut milk, prior to eating Thai food. I have developed an appreciation for how this simple milk, made from an near-impossible to penetrate shell, could be utilized in so many ways. I now keep it stocked in my pantry as a staple ingredient because of its versatility. The last dish I will share is a rice dish. Being married to a Filipino, this country girl who grew up with a meat and potatoes staple diet, has learned more than I ever considered possible about rice. Thai rice is a bit different. They offer several varieties of rice dishes. My favorite is pineapple fried rice. It has pineapple, scrambled egg, chicken, prawns, cashew nuts, raisins, yellow curry and onions. I will typically omit the chicken and sometimes the shrimp. It’s a different fried rice than many are used to eating, but it has a wonderful flavor that is great with any dish. So there you have it. Some of my favorite Thai dishes. Next time, I’ll plan the picture taking better. I snapped a couple quick shots before it was gobbled up. It’s hard to resist the incredible and delicious scents when the platters are set down in front of you.